(2009) "Cryin' for Me (Wayman's Song)"
"American Ride" is a song written by Joe West and Dave Pahanish and recorded by American country music artist Toby Keith. It was released in July 2009 as the first single and title track from Keith's 2009 album of the same name. The song became Keith's 19th number one hit on the US Billboard Hot Country Songs chart for the week of October 10, 2009. The song is an up-tempo song in which the narrator lists off various politically oriented issues in the United States, such as illegal immigration ("Tidal Wave comin' 'cross the Mexican border"), political correctness ("Don't get busted singin' Christmas carols"), lawsuits ("Spill a cup of coffee, make a million dollars"), rising gasoline prices ("Why buy a gallon when it's cheaper by the barrel?") and the decreased importance of religion ("Plasma gettin' bigger, Jesus gettin' smaller"), but states that he is still proud to live in America. It also references Donald Trump's outlash at the 1996 Miss Universe winner, Alicia Machado's slight weight gain. Dave Pahanish and Joe West, the writers, had originally titled the song "American Life" when they submitted the demo to Keith. Pahanish and West talked about "the funny, but irritating, things in life that really tick people off." Keith also had the song on his iPod a year before recording it. The song has received mixed reviews from music critics. Dan Milliken of Country Universe gave it mixed review. In his review, he says that the intro sounded like a "hamster dance" version of Reba McEntire's "Strange", and that the rest of it sounded like a car commercial. He also said that he could not tell if the song's lyric was an attempt to be serious or satirical: "I can’t say I don’t find it all amusing on some strange level. There seems to have been a serious attempt to make social commentary here, and it was pretty hit-or-miss, or maybe more of one than the other, depending on your perspective." He ultimately declined to give the song a letter grade. Jed Gottlieb of The Boston Globe said that the song "lets him make fun of his status as a political punching bag while mocking both the right and left." Stephen Thomas Erlewine of Allmusic viewed it positively, saying that it was not "jingoistic" and that it "casts a cynical eye[…]not celebrating down-home values but wondering where we're all headed[.]" The song's music video debuted on the television network CMT on August 13, 2009. Directed by Michael Salomon, it is animated save the very beginning and ending in a style of the JibJab online cartoons. The song's music video consisted of Keith and three guys riding motorcycles while passing a bunch of scenes related to the song's lyrics. Other scenes include evangelist Pat Robertson riding on former United States President George W. Bush's back, and Wall Street, where President Barack Obama is being hoisted in the air by bankers. The last scene of the video shows Keith falling into the boat full of American flags, and then the foreign dictators Muammar Gaddafi, Kim Jong-il, and Fidel Castro portrayed as pirates on larger ships start shooting him with cannons. But Keith goes through and passes through a set of television monitors, where they all have political talk shows on, and the hosts are fighting each other. The video ends with the sign reading "Thanks for visiting America... y'all come back now". Keith told Country Weekly magazine that he was criticized by "blogger terrorists" the day that the video was released, adding, "But they really can't get a fire started in the direction they want to go because the video makes fun of everybody." The song's reference to Liebeck v. McDonald's Restaurants and the common misconception that the lawsuit was frivolous led to a clip of the music video being used in an episode of Adam Ruins Everything which deals with the case. "American Ride" debuted at No. 38 on the U.S. Billboard Hot Country Songs chart for the chart week of July 18, 2009, and reached No. 1 on the chart week of October 10, 2009, becoming his 19th Number One hit. It also debuted at No. 60 on the Swedish Singles Chart for the week of December 19, 2010. ^ a b c Paxman, Bob; Larry Holden (October 12, 2009). "This American Ride: Toby Keith lays it on the line about his controversial new single, the good and bad of American life and his agony over the death of a friend". Country Weekly. 16 (35): 34–38. ^ a b Horner, Marianne (November 9, 2009). "Story Behind the Song: Hit Filled with Ticked-Off Moments". Country Weekly. 16 (39): 22. ^ Dan Milliken (July 10, 2009). 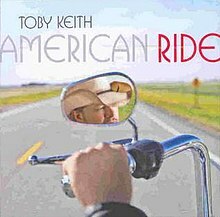 "Toby Keith – "American Ride"". Country Universe. Retrieved July 11, 2009. ^ Gottlieb, Jed (July 23, 2009). "Alpha Dog: Country singer Toby Keith exceeds expectations". The Boston Globe. Retrieved August 18, 2009. ^ Erlewine, Stephen Thomas. "Review: American Ride". Allmusic. Retrieved October 4, 2009. ^ ""American Ride" video". CMT. Retrieved August 18, 2009. ^ Roland, Tom (October 9, 2009). "Toby Keith on quite the ride". Great American Country. Archived from the original on October 12, 2009. Retrieved October 23, 2009. ^ Conover, Adam (Dec 14, 2016). "The Truth About the McDonald's Coffee Lawsuit". CollegeHumor. YouTube. Retrieved June 2, 2018. ^ Lopez, German (Dec 16, 2016). "What a lot of people get wrong about the infamous 1994 McDonald's hot coffee lawsuit". Vox.com. Vox Media, Inc. Retrieved June 2, 2018. ^ "Toby Keith Chart History (Hot Country Songs)". Billboard. ^ "Toby Keith Chart History (Hot 100)". Billboard. This page was last edited on 23 December 2018, at 02:20 (UTC).